Since merging with fellow virtual communications leader Cinchcast, Inc., BeaconLive now offers services and technology to support every type of distributed event – ranging from fully managed, moderator-assisted webcasting productions to do-it-yourself webinar hosting, and everything in between. Looking for a DIY virtual communications and content hub you can tailor to your organization’s specific needs? We've got you covered. Our self-managed solutions power conference calls, webcasts and webinars of every size! After all, you shouldn’t be forced to use a service provider’s operator just because your virtual events have over 100 attendees, right? With BeaconLive’s newly expanded capabilities, you can use your operator, our operator or no operator! It’s your event — you should decide how to run it. Do-it-yourself or have us do it for you… we are here to help! No plug-ins necessary! How many times have you attempted to join a web meeting and only found yourself delayed because you had to install plug-ins? It’s 2016; you shouldn’t need software to simply join an event. There’s no hold times for attendees. We provide everyone with a unique PIN code and/or a web link that allows them to join the event on demand and on time. Registration pages are completely customizable. Brand your registration process to look like an extension of your company’s website! Recurring meetings with no hassle. Manage attendee lists with ease. Morning meetings and sales meetings have never been so easy! Launch events on-the-fly or schedule in advance – with BeaconLive, it’s a snap! Receive accurate meeting analytics. You can’t manage what you don’t measure. Reporting and analytics are part of the event management business. Know who attended and how long they attended. Know if they attended via the phone or over the web. You can even synchronize this data with a Marketing Automation System like Eloqua or your CRM. By streamlining and simplifying the event, meeting and content creation process, we help leading executives, marketing and public relations professionals, meeting and event planners, online publishers, content creators, and online training specialists enhance their internal and external communications! 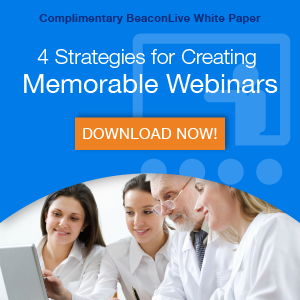 Want to see for yourself how effective BeaconLive’s virtual events platform really is? Simply request a guided tour with one of our specialists to learn more about our self-managed solutions!